The following is my personal opinion and not stated as fact. This post is a quickie in order to gain more exposure on a payment issue I’ve been facing since November 2015 from a smaller network named “BrkMob” (aka BreakMob / brkmob.com [now down]) who is owned by JJGMS Ltd, and the directors of the company are Jamie Law and Jaspal Tatla. I have posted this on STM, as well as on RipOffReport.com and have decided I will post it here as a warning to others. NEVER float with a network or advertiser, get pre-payments when you can, or weekly/bi-weekly payments to reduce your credit-risk. I am now in a situation where I will potentially incur a loss of over $306,000, with over half of that figure being Ad-Spend (so over $150,000 out of my pocket to generate $306,000 which was never paid out). *UPDATE* After hours of back-and-forth communication, Jamie has agreed to a partial “prepayment” to work on some new projects together as a sign of goodwill. It is only a very small portion of the debt, and it is by no means a solution, but I am at least relieved that he agreed to do something to help improve the current situation. I always believed he was a genuine character, I know BrkMob is owed over a $1mm from Purple House, and this is why he is refusing to cover the debts owed. I have edited the original post to discuss my current stance on the situation as I am still not happy with everything, after we had a meeting in person and spent hours on the phone. Hopefully the situation improves soon but it seems rather bleak as the owners at the top of the food-chain don’t seem to be the most reliable in getting their debts repaid, which in turn means BrkMob may not get repaid, meaning myself and many others will be left out of pocket 100s of thousands. Something that Jamie had mentioned during our face-to-face meeting is that he, *should* have put the money he owed to me aside in a holding company, away from BrkMob / JJGMS, so that I would be taken care of, but failed to do so, admitting this was a mistake (amongst others) he himself had made. In my opinion, this puts the onus on Jamie, but he disagrees that is his responsibility to pay out until Purple House pays him first. 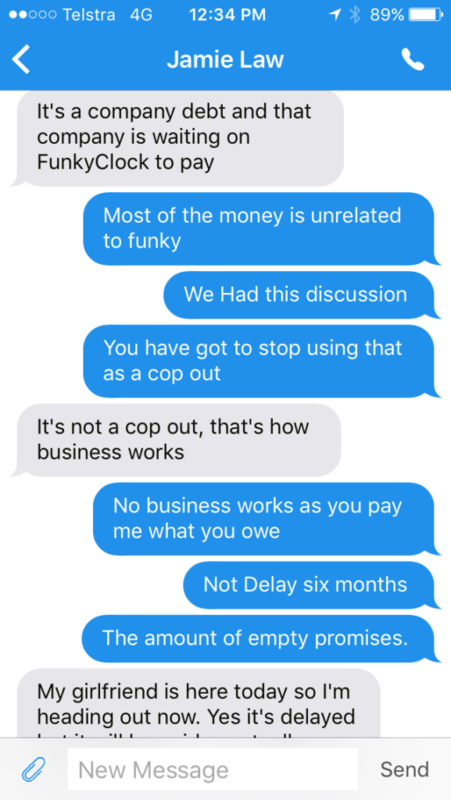 He admitted that I am technically the only one owed directly by BrkMob (for a portion of the debt), and everyone who is owed for FunkyClock is owed directly by Purple House/Puprle123. To be “factually correct”, Jamie does not have a personal fortune worth millions, but all the money which directly or indirectly belongs to himself is kept in companies. In essence, he and Jaspal still have access to millions, but are legally protected by storing the money in companies or offshore entities. So effectively, they do have millions. Here’s just a heads up for those in the industry, the entire suite of companies behind these sweepstakes offers came crumbling down (Purple123/PurpleHouse), dragging down BrkMob in the process. The white-label of PurpleHouse’s SweepStakes product and name it “FunkyClock”, which subsequently went down with all other products as soon as their processing and merchant accounts started getting hit hard with charge-backs and bank fines, is what caused BrkMob to go down and subsequently burn everyone who ran directly through him in the process. My company was one of the worst hit, with much of the debt owed completely unrelated to the FunkyClock product itself, but rather a large amount of traffic being run to other offers. To note I am myself a sole individual affiliate marketer and do not run a large network like the majority of those owed. 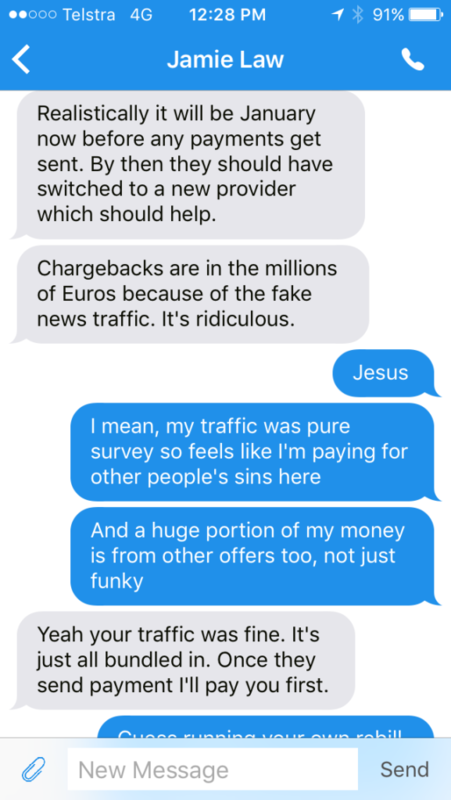 To note, NONE of my traffic was considered bad quality, in fact, Jamie has mentioned numerous times that my traffic was some of the best and that I would be a priority in being paid for numerous reasons, being, most of the debt is unrelated to FunkyClock, and my traffic quality was always solid. The total debt was just north of $376,000 USD, of which, only two payments were ever made, one of just over $15,118 USD made in November 2015, and another payment of $55,000 USD made in Feb 2016. The total remaining debt is $306,387.75 — Update, another $50,000 was finally negotiated and paid to me in August 2016, but was paid as a “loan” to stimulate a partnership/project to help chip away at this debt to me which is unrelated to FunkyClock as I am the only person owed for non-FunkyClock traffic. I stopped sending traffic to BrkMob around October/November when it came to my attention that payments were not being sent out any more to anyone. Prior to that, I was encouraged to run more traffic even when behind the scenes, things were falling apart. The same rang true with other companies involved who are also owed. Communication with Jamie has mostly been good, as he responds to messages still to this date; however, he has made a lot of empty promises, numerous payment plans that never came true, one in December outlined in an Excel Spreadsheet that never came true, another one back in January where I was promised payments of $20,000 a week until the Non-FunkyClock related debt was covered ($224,431.50) and others. After constantly questioning Jamie, I was told that he could no longer make that payment due to legal reasons (the money was coming from companies/bank accounts which were NOT JJGMS Ltd and the banks wouldn’t allow the transfer). Jamie came across as a very unassuming, genuine character, and I still hope to this day that he finds a way to repay his debt with myself and many other companies, however, at this stage I felt it’s necessary to make this public so that everyone in the industry is aware that Jamie Law, BrkMob (BreakMob / brkmob.com [now offline]), his business partner Jaspal Tatla, the entire crew that owns Puprle123, Westeros, Myoshi, Bitgans Ltd and their many offers (RockyFroggy, Voupo, LuxQuiz) are in debt and to steer very clear of doing business with them (NB: a few people just recently left the company and were not paid salaries. I’ve also heard through the grapveine that their current employees have not been recieving salaries). Other names to remember are Christian Bech and Adam Lindstrom who from my understanding own Purple House / Purple123. From my understanding, Adam and Christian are partners, Christian/Adam have a history of issues with payments ad have plenty of complaints against entities in which they operate (Westeros, Bitgans Ltd and several others). 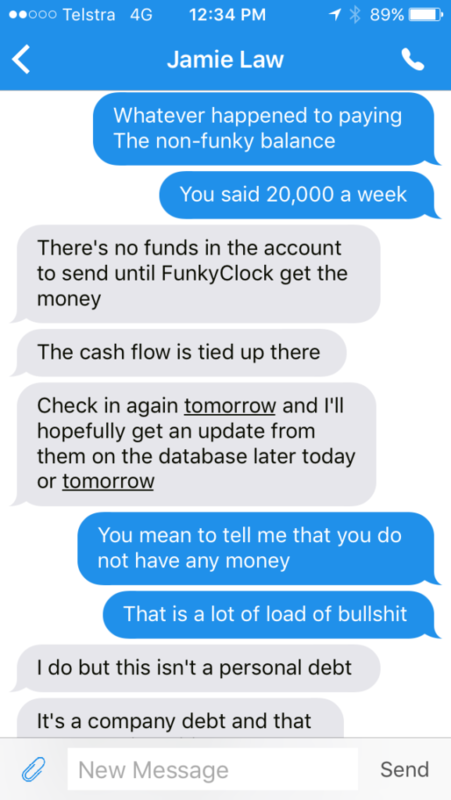 Jamie claims that the SkillGame companies owe his network BrkMob, and thus therefore are the ones responsible for owing me money on the FunkyClock balance. Whilst I disagree with Jamie’s stance on this, as I was using BrkMob’s tracking links and my contract was legally with BrkMob and not PurpleHouse/Purple123. Jamie keeps claiming that “BrkMob” has no money and always seems to ignore the fact that he himself, and his business partner, have access to plenty of money and they were are the sole directors / owners of the company, the the onus is on them, REGARDLESS of which entity we are discussing. 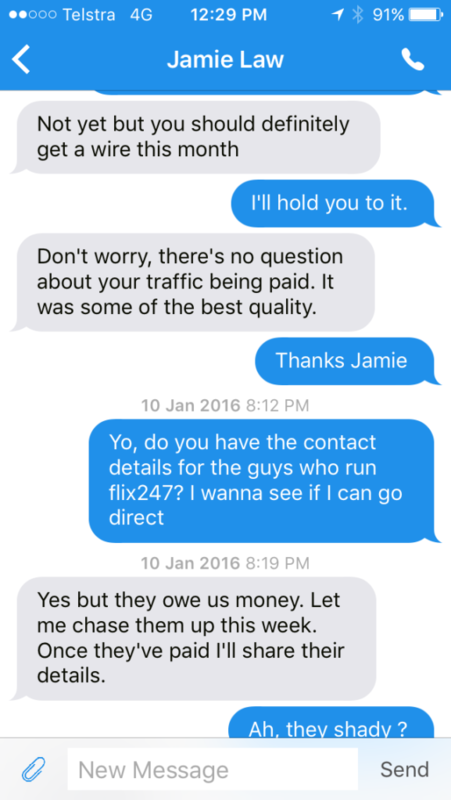 After speaking with Jamie last, he had mentioned numerous times that “you may not get the entire payment at all” — a far cry from the conversation we were having a few months ago, where I said his situation is reminiscent of Ryan Eagle all over again and he claimed I would “eat my own words when he repays every last dollar”. This tracking platform called Thrive by the guys over at iPyxel which I love, is the best in the industry. It’s constantly improving and making strides, and the best part about it is it can be self-hosted. The offer a 30-day trial and it’s $99 a month thereafter which is well worth the investment. They also offered a managed service, which I use, for larger scale affiliates who don’t want to bother with managing a server.